We all have that coveted little black dress in the back of our closets. You know, the one that fits you like a glove and is bound to turn heads whenever you wear it out. Unfortunately the warm California sun doesn’t mesh with dark colors when the temperatures start to rise. With help from this week’s Chic, I have a stunning alternative for your go-to dress… Let me reintroduce you to summer’s favorite frock: the little white dress. Say hello to our newest Chic of the Week who sure knows a thing or two about how to rock a LWD… Olivia! Whether I’m decorating a room or picking out an outfit for the night, I tend to gravitate towards whites and neutrals. There’s something so simple yet sophisticated about a little white dress – plus, you can never have too many of them for the summer months. Wearing a dress with a full skirt can be a tricky trend for petites to pull off, but the defined waistline, absence of any bold textures or prints, and sweetheart neckline make this frock petite friendly! I wore red lips to add a romantic touch and to compliment this summery pair of strappy red heels. A special thank you to miss Olivia for putting this romantic ensemble together just for our LaurenConrad.com readers! 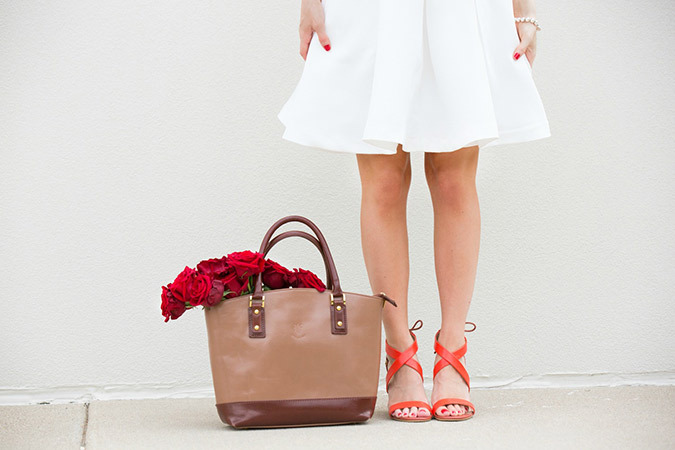 Be sure to check out her blog for more outfit inspiration just as beautiful as the one above. I know I’ll be adding this dress to my summer wardrobe ASAP. For me it just screams date night. What do you ladies think? Do you have a favorite little white dress? If you do, share their links with me in the comments so that I can go window shopping!